As boys growing up, we had the incredible privilege of being pastor’s sons. Our dad was a man who faithfully studied and expounded the word of God each Sunday. Early memories recall our dad spending Saturday evenings in his softly lit study pouring over the word of God and making final preparations for Sunday’s messages. From a very young age, we sat under our dad’s preaching Sunday upon Sunday and, though we may not have had extensive amounts of intake, the word was being sown – which by the grace of God has not returned void. But, not only have we been richly blessed, countless others who sat under his preaching ministry have been changed forever by the faithful preaching of the gospel. This is a rich heritage and generations have been and will be blessed. However, this rich heritage is currently sitting on a shelf in the form of cassette tapes, which have been gathering dust for the last 15 years. Times have changed and dad’s 15 plus year preaching ministry, which includes almost the entire New Testament and portions of the Old, needs to be put into a format for the next generation to access and be blessed. 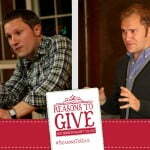 So, as we look to this year’s annual Reasons to Give campaign at Vision4Living Ministries, we, his sons, are asking you to help us make this project a reality. Whether you have been blessed to sit under dad’s preaching during his pastoral years or have just recently been blessed through his teaching, we need your generous donation to bring this rich resource to the next generation of listeners. Digitize 15 years of sermon audios and catalog the sermon files for easy access. Remodel V4L’s website to meet demands of the modern age and give easy access to this resource. To accomplish this project, we have set a goal of raising $10,000 before the end of the year. This will help offset the cost of man-hours and services to make this ministry a reality. But we cannot accomplish this without your partnership in this work and ministry. In advance, we are grateful for your partnership. You are a blessing and it is a privilege to work together to spread the gospel and magnifying the matchless glory of our God to this generation and the next. Our prayer for you is this: May God bless you this Christmas with a greater awareness of Christ – the revealed glory of God.